The Kerala state BJP leadership said they had no knowledge of recent reports that south Indian actor Mohanlal was all set to join the saffron party. They were reacting to news reports which claimed that the RSS wanted Mohanlal to contest Lok Sabha polls from Thiruvananthapuram on a BJP ticket. Kerala BJP president P.S. Sreedharan Pillai told the WEEK that the state unit was not aware of any such move. “There has been no official communication on the matter yet. I also heard the rumour,” he said. But, he added that they would be thrilled if Mohanlal joins the party. “We will be very happy if he agrees to join us. We garnered 2,80,000 votes in Thiruvananthapuram in the last Lok Sabha polls. If Mohanlal stands as BJP candidate, it will be a sure seat for us,” he said. The actor had recently met with Prime Minister Narendra Modi, inviting him to appear at an event held by the former's charity foundation in Wayanad, which had set tongues wagging. 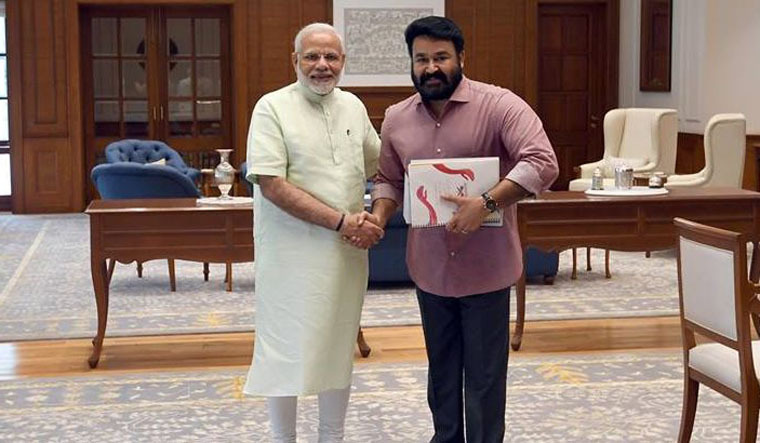 After the meeting, Mohanlal tweeted that PM Modi assured all possible assistance for Kerala, which is currently reeling under destruction caused by floods. "He has assured all support and offered to participate in the Global Malayalee Round table that can formulate futuristic solutions for a New Kerala. Hon. PMO India has also appreciated our vision to set up a Cancer Care Centre to cater to the needs of the under-privileged," Mohanlal tweeted. However, the actor, in a clear attempt to pre-empt political pigeonholing, met Kerala Chief Minister Pinarayi Vijayan before his parley with the prime minister. “Get well soon Honourable Chief Minister Pinarayi Vijayan sir,” the actor had tweeted. Vijayan was set to travel to the United States for medical treatment. When asked whether the state unit arranged the meeting between the prime minister and the actor, Pillai said they were not in the loop. “Mohanlal himself arranged the meeting,” said Pillai.